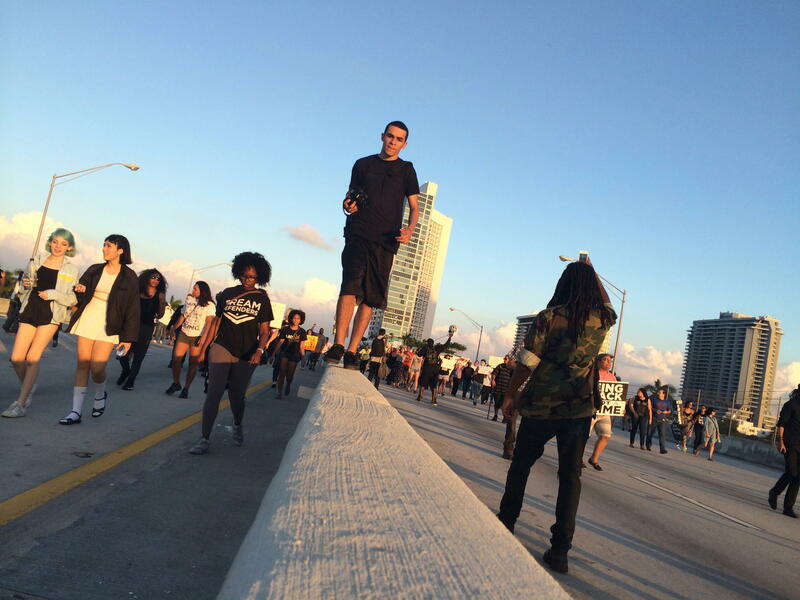 Protestors in Miami on Sunday walk on a deserted I-195. Click here to listen to the audio version of this story, where you can listen to some of the protestors' chants. The protesters walked in solidarity with others around the world this weekend -- from Detroit to Delhi, all in response to the deaths of Michael Brown and Eric Garner. The two unarmed black men died at the hands of police. Two separate grand juries recently decided not to bring any criminal charges against the officers involved. Saturday marked 16 months since Israel “Reefa” Hernandez died at 18 after he was tasered by a Miami Beach police officer. Reefa had been caught spray-painting the wall of a shuttered McDonald's. 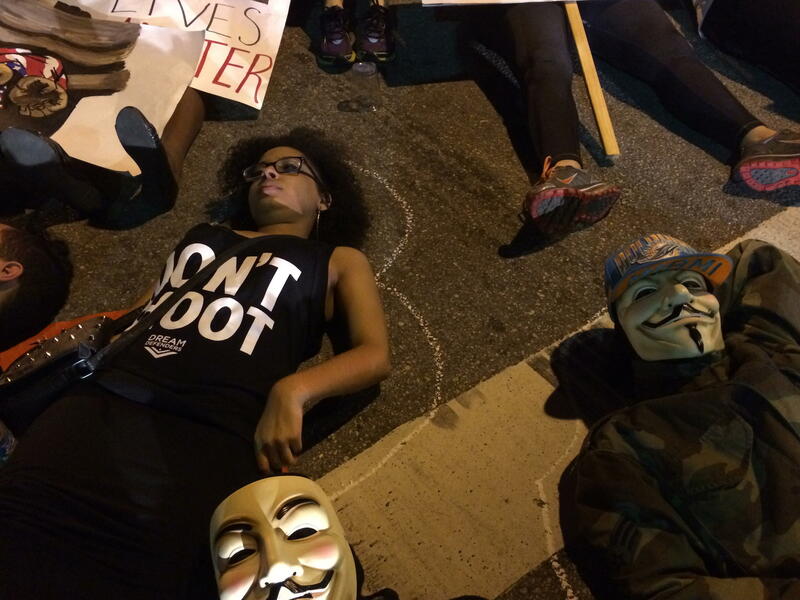 Protesters do a "die in" in the middle of an intersection. A few protestors outlined people in chalk, calling on imagery from crime scenes. 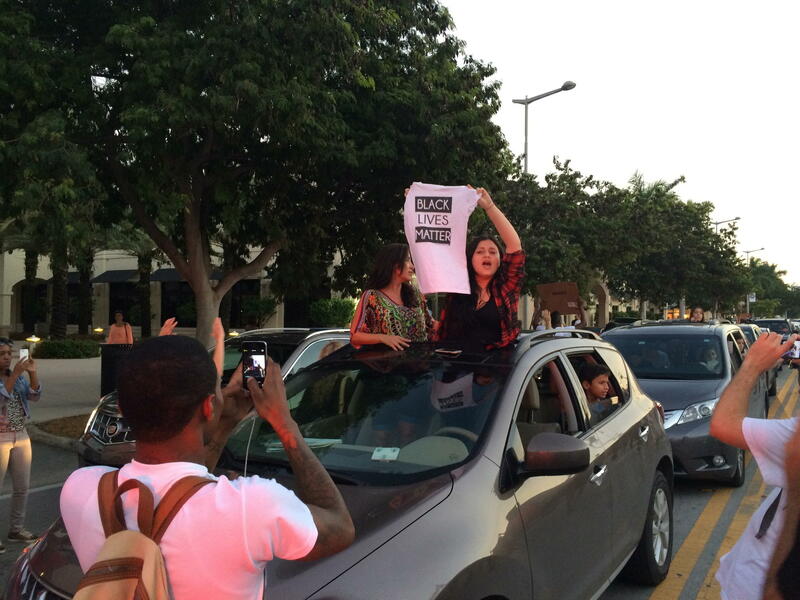 Protesters in Miami say they’re angry about continued racism and police brutality. Jeannoel wanted his daughters to see the protesters, a moment he hopes will be the start of historic change. Dream Defender Sherika Shaw says in her life, fear is pervasive. Some of the people in stopped cars joined in the protests, others expressed outrage over the inconvenience. Shaw was one of the leaders of the Miami protests. She says Art Basel is the perfect time to air these grievances -- an easy international audience. Some of those people who came to Miami for Art Basel ended up joining the protest, like Dan Higgins from Gainesville. These are the first large-scale protests South Florida has seen in several years -- even the Occupy protests were relatively small compared to this. Police were few and far between at the protests, donning windbreakers and safety vests instead of riot gear. One thing that stood out in Miami was the police response. There were very few visible cops and those who were visible sported windbreakers and safety vests, not riot gear as police in other cities. 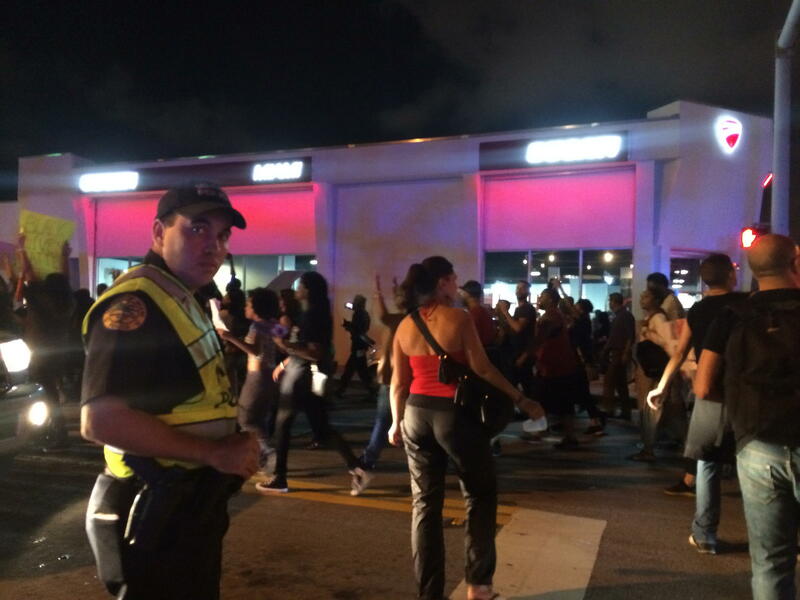 Javier Ortiz of the Miami Police Department was in charge of coordinating the police response to Friday’s protest. To support the protesters even as they shut down parts of the city -- at times lying down in the middle of intersections. Then, one or two people would outline people in chalk, like they do in television crime shows to mark where a dead body lies. Protesters on Sunday shut down the I-195 again, where they walked along an empty highway. They also shut down the narrow streets of Wynwood, where they pushed through Art Basel weekend crowds. Protestors on I-195 hold signs for cars passing underneath the overpass to see. One tactic protests leaders used to try and keep things from boiling over was to have the group walk in silence. Hundreds of people moving together with only the occasional honk, police walkie-talkie chatter and helicopter hum breaking the silence. Voices that they hope people will raise at their Committee on State Violence meeting on Tuesday. There, protest leaders will debrief about the weekend’s events and flesh out more concrete goals and demands. The meeting will be held at the offices of Florida New Majority at 6:00p.m. Tuesday at 8330 Biscayne Blvd. Miami, FL. Just as they did in several other American cities on Thursday, South Florida fast food workers and union organizers demonstrated for higher wages and union rights.